Did you know that as humans we inhale and exhale approximately 10.000 litres of air every single day? Because this is such a large quantity of air to pass through our lungs every day there is going to be certain infectious agents, toxicants, allergenic or carcinogenic substances which we inhale. These substances influence the mucous membranes which encase the respiratory framework inside your lungs. Respiratory illnesses are a standout amongst the most well-known infections. From the common cold to diseases of the respiratory framework. 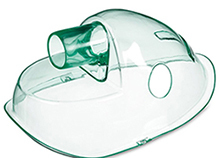 Inhalation treatments such as that of the Beurer IH-18 Inhalator Nebuliser help to calm upper and lower airway problems - and they may even become a necessity in some situations. Approx. 5 % of adults and up to 10 % of infants experience the ill effects of suffering from the constriction of the airways, the alleged bronchial asthma. Inhalation has the benefit of transporting the active ingredient straight to the target area. So how does inhalation therapy work? The impact of inhalation therapy treatment relies upon the active ingredient utilised, the nebulisation rate, and the molecule size. The nebulisation rate is measured in ml/min and alludes to the volume per unit of time released by the nebuliser. The higher the nebulisation rate the shorter the obliged inhalation time, on the grounds that active substances are released at a higher volume. You can successfully use Inhalation therapy both with the addition of your selected medicines and also with a normal saline solution. This can be of great benefit especially in the presence of too much dust exposure, cigarette smoke, air-conditioned and those dry environments. What are the benefits of using the new Beurer IH18 Compressor Nebuliser? 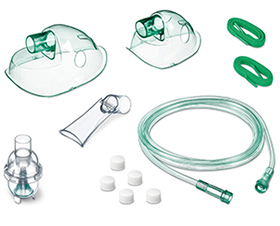 A yearly Nebuliser accessory set is also available to purchase should you wish to replace your mask, tubes and filters and are carried here in stock for all Beurer Nebulisers sold here at StressNoMore. We are the official retailer of Beurer Health products here in the UK and the quality and efficacy of their health monitors and products is exceptional. Improve the quality of your air and breathing today by investing in the Beurer IH-18 Inhalator Nebuliser.